All-Terrain Vehicles (ATVs) can be a great tool on the farm or ranch, but using them improperly can greatly increase the risk of accident and injury on the job. Keep these tips in mind to prevent ATV accidents and get the job done right the first time. Approach at low speeds to avoid frightening(startling) the animals. High speeds mean higher chances of losing control. If the animals are causing you frustration, don’t act on it. If you do, you’ll overlook hazards that could injure you or the animals. Use caution making sharp turns at speed. Animals can always cut sharper than a vehicle can. You’ll probably flip the ATV if you try to keep pace. Remember, you are eye-to-eye with the animal. 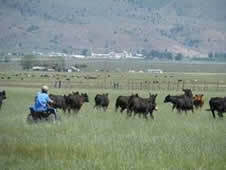 Communicate with others on ATVs or horses to prevent collisions. Use hand signals, radios, or something similar. On hills, always lean you body uphill to prevent tipping and flipping. If you’ve got a big job to do, don’t ride alone. If you’re moving animals, use ATVs alongside horses, dogs, trucks, etc. A motorcycle half-helmet and a pair of glasses will reduce injury risks without impairing your comfort or mobility. Get hands-on training from a certified ATV Safety Institute trainer.